Aircraft Electronics and Electrical Systems is written for aircraft engineering students. This guide provides reference material for the avionic and aircraft electrical units of various standards and modules. This guide is designed to cover the essential knowledge base required by certifying mechanics, technicians and engineers engaged in engineering maintenance activities on commercial aircraft and in general aviation. In addition, this guide should appeal to members of the armed forces and others attending training and educational establishments engaged in aircraft maintenance and related aeronautical engineering programs. This guide will also appeal to others within the aircraft industry who need an insight into electrical and electronic systems, e.g. pilots, engineering managers, etc. The guide provides an introduction to the fundamentals of electrical, electronic and digital theory that underpins the principles of systems covered in the remainder of the guide. For the reader that already has background knowledge of the fundamentals, the sub sequent sections can be read as individual subjects. - Aircraft Communications and Navigation Systems . The books in this series have been designed for both independent and tutor-assisted studies. They are particularly useful to the 'self-starter' and to those wishing to update or upgrade their aircraft maintenance license. The series also provides a useful source of reference for those taking ab initio training programs approved organizations as well as those following related programs in further and higher education institutions. The title of this guide, Aircraft Electronics and Electrical Systems, has been specifically chosen to differentiate between other avionic systems such as communications, navigation, flight guidance and instruments. The term avionics (aviation electronics) was first used in the late 1940s to identify electrical and electronic equipment such as radar, radio navigation and communications, although the term was not in general use until the late 1960s. During the 1970s, integrated computer-based systems were being developed, e.g. ground proximity warning systems; these used a number of existing aircraft sensors that monitored parameters such as barometric altitude, vertical speed and radio altitude. The continued development and integration of electrical and electronic systems, together with the widespread use of integrated circuits, microprocessors, data communications and electronic displays, have given new meaning to the term avionics. Aircraft engineers will be exposed to in-service aircraft using older technology, together with the new aircraft entering service based on modern technology. Using trends from the last 40 years, there will be an ever-increasing dependence on avionic systems. The eventual out come could be the all-electric aircraft, a concept where traditional mechanical linkages, hydraulics and pneumatics are totally replaced by electrical and electronic systems. This guide establishes a reference point for engineering students; it does not attempt to address all system types for all aircraft types. It is also important to note that this guide does not attempt to provide the level of detail found in the aircraft publications, including the maintenance and wiring diagram manuals. Although there are many examples quoted in the guide that are based on specific aircraft types, this is only done to illustrate a specific point. Throughout the guide, the principles and operation of systems are summarized by numerous 'Key points' . The reader will be invited at regular intervals to assess knowledge via ' Test your understanding ' questions. Finally, the principles and operation of systems are put into the context of aircraft maintenance engineering by numerous 'Key maintenance points'. Each section concludes with a number of multiple choice questions; the reader will then find revision papers in the appendices for additional assessment purposes. A summary of the guide is as follows. Section 1 sets the scene by providing an explanation of electricity in terms of the motion of electric charge and basic electrical quantities such as current, voltage, resistance and power. The section provides an introduction to electrostatics and capacitors and also to electromagnetism and inductors. Here the emphasis is on the key concepts and fundamental laws that underpin the operation of the electrical systems found in aircraft. The section provides a detailed introduction to alternating current and trans former principles, and concludes with an essential section on safety. This section will be particularly useful if you have not previously studied electrical principles. It has also been designed to help fill any gaps in your knowledge and bring you quickly up to speed. Electronic fundamentals are introduced in Section 2. This section explains the principles, construction and basic application of a variety of common semi conductor devices including diodes, thyristors, transistors and integrated circuits. The section includes a detailed explanation of rectifier circuits, both half wave and full-wave types, and the use of transistors as current amplifiers. The advent of digital techniques and integrated circuits has revolutionized the scope and applications for avionic systems. Section 3 provides readers with an introduction to digital techniques. The function and operation of logic gates are established before moving on to explore the use of combinational and sequential logic in several typical aircraft applications. The section also provides an overview of coding systems and the logic systems that are used to represent numerical data. An introduction to aircraft data bus systems is provided together with a brief overview of the architecture and principal constituents of simple computer systems. Generators and motors are widely used in modern aircraft. Section 4 explains the principles on which they operate as well as the theoretical and practical aspects of aircraft power generation and distribution. Three-phase systems and methods of connection are described in some detail. If you are in any doubt as to whether or not you should work through Sections 1 to 4, you can always turn to the multiple choice questions at the end of each section to assess your knowledge. All electrical and electronic systems require a power source. Batteries are primary sources of electrical power found on most aircraft delivering direct current (DC). Section 5 reviews the battery types used on aircraft, typical applications and how they are installed and maintained. There are several types of battery used on aircraft, usually defined by the types of materials used in their construction; these include lead-acid and nickel-cadmium batteries. Other types of battery are being considered for primary power on aircraft; these include lithium and nickel-metal hydride. In Section 6, we review the other sources of electrical power used on aircraft and their typical applications. Electrical power can be derived from a variety of sources; these are categorized as either primary or secondary sources. Batteries and generators are primary sources of electrical power; inverters and trans former rectifier units (TRU) are secondary sources of power. This power is either in the form of direct or alternating current depending on system requirements. Generators can either supply direct or alternating current (AC); the outputs of generators need to be regulated. Inverters are used to convert DC (usually from the battery) into alternating (AC). Transformer rectifier units (TRU) convert AC into DC; these are often used to charge batteries from AC generators. In some installations, transformers (as described in Section 1) are used to convert AC into AC, typically for stepping down from 115 to 26 V AC. In addition to onboard equipment, most aircraft have the facility to be connected to an external power source during servicing or maintenance. An auxiliary power unit (APU) is normally used for starting the aircraft's main engines via the air distribution system. While the aircraft is on the ground, the APU can also provide electrical power. In the event of generator failure(s), continuous power can be provided by a ram air turbine (RAT). The safe and economic operation of an aircraft is becoming ever more dependent on electrical and electronic systems. These systems are all interconnected with wires and cables; these take many forms. Section 7 describes the physical construction of wires and cables together with how they are protected from overload conditions before power is distributed to the various loads on the aircraft. Electrical wires and cables have to be treated as an integral part of the aircraft requiring careful installation; this is followed by direct ongoing inspection and maintenance requirements for continued airworthiness. Wire and cable installations cannot be considered (or treated) as 'fit and forget‘. System reliability will be seriously affected by wiring that has not been correctly installed or maintained. We need to distribute the sources of electrical power safely and efficiently and control its use on the aircraft. Once installed, the wires and cables must be protected from overload conditions that could lead to overheating, causing the release of toxic fumes, possibly leading to fire. Legislation is being proposed to introduce a new term: electrical wire interconnection system (EWIS); this will acknowledge the fact that wiring is just one of many components installed on the aircraft. EWIS relates to any wire, wiring device, or combination of these, including termination devices, installed in the air craft for transmitting electrical energy between two or more termination points. Electrical power is supplied to the various loads in the aircraft via common points called busbars. In Section 8, we will focus on busbar configurations and how these are arranged for the protection and management of the various power supply sources available on the aircraft. The electrical power distribution system is based on one or more busbar(s); these provide pre-determined routes to circuits and components throughout the aircraft. The nature and complexity of the distribution system depend on the size and role of the aircraft, ranging from single-engine general aviation through to multi-engine passenger transport aircraft. The word 'bus' (as used in electrical systems) is derived from the Latin word omnibus meaning 'for all'. The busbar can be supplied from one or more of the power sources previously described (generator, inverter, transformer rectifier unit or battery). Protection devices, whether fuses or circuit breakers, are connected in series with a specific system; they will remove the power from that system if an over load condition arises. There also needs to be a means of protecting the power source and feeder lines to the busbar, i.e. before the individual circuit protection devices. There are many systems on an aircraft that need to be controlled and/or monitored, either manually by the crew, or automatically. Section 9 describes generic controls and transducer devices used on aircraft. A switch provides the simplest form of circuit control and monitoring. Switches can be operated manually by a person, activated by sensing movement, or controlled remotely. Many other aircraft parameters need to be measured; this is achieved by a variety of transducers; these are devices used to convert the desired parameter, e.g. pressure, temperature, displacement, etc. into electrical energy. The aircraft engine is installed with many systems requiring electrical power. Section 10 describes engine starting, ignition and indicating system for both piston and gas turbine engines. The predominant electrical requirement (in terms of current consumption) is for the engine starting system. General aviation aircraft use electrical starter motors for both piston and gas turbine engines; larger transport air craft use an air-start system (controlled electrically) derived from ground support equipment or by air cross-fed from another engine. Electrical starting systems on piston and gas turbine engines are very different. The trend towards the all-electric aircraft will see more aircraft types using electrical starting methods. The engine also requires electrical power for the ignition system; once again, the needs of piston and gas turbine engines are quite different. Although starting and ignition systems are described in this section as separate systems, they are both required on a co ordinated basis, i.e. a means to rotate the engine and ignite the air/fuel mixture. Electrical and electronic requirements for engines also include the variety of indicating systems required to operate and manage the engine. These indicating systems include (but are not limited to) the measurement and indication of: rotational speed, thrust, torque, temperature, fuel flow and oil pressure. Indications can be provided by individual indicators or by electronic displays. The management of fuel is essential for the safe and economic operation of the aircraft. The scope of fuel management depends on the size and type of air craft; fuel is delivered to the engines using a variety of methods. Section 11 provides an overview of fuel management on a range of aircraft types. The system typically comprises fuel quantity indication, distribution, refueling, defueling and fuel jettison. In the first instance, we need to measure the quantity of fuel on board. Various technologies and methods are used to measure fuel quantity: this depends mainly on the type and size of aircraft. Technologies range from sight gauges through to electronic sensors. On larger aircraft, fuel is fed to the engines by electrically driven pumps. On smaller aircraft, an engine-driven pump is used with electrical pumps used as back-up devices. Solenoid or motorized valves are used to isolate the fuel supply to engines under abnormal conditions. On larger aircrafts, the fuel can be transferred between tanks; this is controlled manually by the crew, or automatically by a fuel control computer. Lighting is installed on aircraft for a number of reasons including: safety, operational needs, servicing and for the convenience of passengers. Section 12 reviews a number of lighting technologies and the type of equipment used in specific aircraft applications. The applications of aircraft lights can be broadly grouped into four areas: flight compartment (cockpit), passenger cabin, exterior and servicing (cargo and equipment bays). Lights are controlled by on/off switches, variable resistors or by automatic control circuits. Passenger transport and business aircraft are fitted with a range of cabin electronic equipment for passenger safety, convenience and entertainment. Typical applications for this equipment includes lighting, audio and visual systems. Section 13 describes the many types of systems and equipment used for passenger safety, convenience and entertainment. Audio systems include the passenger address system used by the flight or cabin crew to give out safety announcements and other flight information. These announcements are made from hand-held microphones and are heard over loudspeakers in the cabin and passenger head sets. The same system can be used to play automatic sound tracks; this is often used for announcements in foreign languages, or to play background music during boarding and disembarkation. A range of galley equipment is installed on business and passenger aircraft. The nature of this equipment depends on the size and role of the aircraft. Air conditioning is provided in passenger aircraft for the comfort of passengers; pressurization is required for flying at high altitudes. Airstairs allow passengers, flight crew and ground personnel to board or depart the aircraft with out the need for a mobile staircase or access to a terminal. All of these systems have electrical/electronic interfaces and control functions. Section 14 reviews airframe systems such as landing gear control and indication, control surface position and indicating systems. 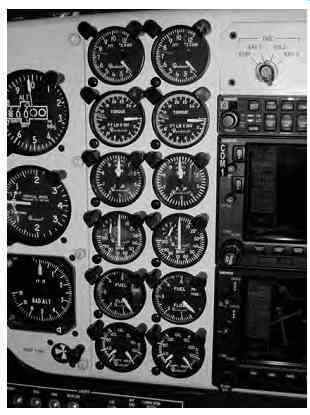 Various sensors are needed for the monitoring and control of airframe systems. Broadly speaking, the sensors can be considered as detecting one of two states (or 'conditions'), or a variable position. Two-state conditions include: landing gear (up or down) or cabin doors (open or closed). Variable positions include: control surfaces and flap position. Micro-switches or proximity sensors detect two-state positions; variable position devices are detected by a variety of devices including synchros and variable resistors. Section 15 describes a variety of systems installed on aircraft to protect them from a variety of hazards including: stalling, ice, rain, unsafe take-off configuration and skidding. Stall protection systems provide the crew with a clear and distinctive warning before an unsafe condition is reached. Flying in ice and/or rain conditions poses a number of threats to the safe operation of the aircraft; ice formation can affect the aerodynamics and/or trim of the aircraft. The configuration warning system (also known as a take off warning system) provides a warning if the pilot attempts to take off with specific controls not selected in the correct position, i.e. an unsafe configuration. The anti-skid system (also called an anti-lock braking system: ABS) is designed to prevent the main landing gear wheels from locking up during landing, particularly on wet or icy runway surfaces. Fire on board an aircraft is a very serious hazard; all precautions must be taken to minimize the risk of a fire starting. In the event that a fire does occur, there must be adequate fire protection on the aircraft. Section 16 focuses on the equipment and systems used to detect fire and smoke together with the means of delivering the fire-extinguishing agent. The subject of fire protection theory is a branch of engineering in its own right. Basic fire protection theory is covered in this section to provide the reader with sufficient information to understand how this theory is applied through aircraft electrical systems. During the 1970s, studies were carried out by accident investigators and regulatory authorities to examine one of the most significant causes of aircraft accidents of the time: controlled flight into terrain (CFIT). This can be defined as an accident where a serviceable aircraft, under the control of a qualified pilot, inadvertently flies into terrain, an obstacle or water. Section 17 describes the generic name given to this type of protection: terrain awareness warning system (TAWS). CFIT accidents usually occur during poor visual conditions, often influenced by other factors, e.g. flight crew distraction, malfunctioning equipment or air traffic control (ATC) miscommunication. With CFIT, the pilots are generally unaware of this situation until it is too late. Ground proximity warning system (GPWS) were developed in 1967 to alert pilots that their aircraft was in immediate danger of CFIT. This system was further developed into the enhanced ground proximity warning system (EGPWS) by adding a forward-looking terrain avoidance (FLTA) feature, made possible via global positioning system technology. One of the fundamental electrical/electronic systems associated with the aircraft industry is the crash survivable flight data recorder (FDR). This is often referred to in the press as the ' black box ‘, even though the item is actually bright orange! Flight data recorders used for accident investigation are mandatory items of equipment in commercial transport aircraft. Efforts to introduce crash-survivable flight data recorders can be traced back to the 1940s; the FDR has now been supplemented with the cockpit voice recorder (CVR). Section 18 reviews the range of FDR/CVR technologies that are employed for both accident investigation and trend monitoring. Recorders are used after an incident or accident as an integral part of the investigators ' efforts to establish the cause(s). Data recorders can also be used to indicate trends in aircraft and engine performance. Algorithms are established for healthy and normal conditions during the aircraft's flight-testing program and the early period of service. These algorithms include engine parameters such as engine exhaust temperature, oil pressure and shaft vibration for given speeds and altitudes. These parameters are then monitored during the aircraft's life; any deviations from the norm are analyzed to determine if the engine requires inspection, maintenance or removal. One of the consequences of operating electrical and electronic equipment is the possibility of disturbing, or interfering with, nearby items of electronic equipment. Section 19 looks at some of the implications of interference from electrical and magnetic fields. The term given to this type of disturbance is electromagnetic interference (EMI). Electrical or electronic products will both radiate and be susceptible to the effects of EMI. This is a paradox since many principles of electrical engineering are based on electromagnetic waves coupling with conductors to produce electrical energy and vice versa (generators and motors). Furthermore, systems are specifically designed to transmit and receive electromagnetic energy, i.e. radio equipment. In complex avionic systems, the consequences of EMI can cause serious, if not hard-to-find-problems. The ability of an item of equipment to operate alongside other items of equipment without causing EMI is electromagnetic compatibility (EMC). Modern digital equipment operates at very high speed and relatively low power levels. In addition to EMI, high-intensity radiated fields (HIRF) are received from the external environment, e.g. from radio and radar transmitters, power lines and lightning. The high energy created by these radiated fields disrupts electronic components and systems in the aircraft. (This effect is also referred to as high-energy radiated fields - HERF.) The electromagnetic energy induces large currents to flow, causing direct damage to electronic components together with the secondary effects of EMI. Advances in electronic technology bring many new features and benefits, e.g. faster processors, higher density memory and highly efficient displays. These advances are primarily due to the reduction in the physical size of semiconductor junctions; this leads to higher-density components in given size of integrated circuit. One significant problem associated with certain types of semiconductor devices is that the smaller junctions are susceptible to damage from electrostatic voltages. This is a problem that can potentially affect a wide range of electronic equipment fitted in an air craft. Effects range from weakening of semiconductor junctions through total failure of the equipment; both these effects can occur without any visible signs of damage to the naked eye! Electrostatic sensitive devices (ESSD) are electronic components that are prone to damage from stray electrical charge produced primarily from human operators. This problem is particularly prevalent with high-density memory devices and electronic displays. Weakening and dam age to static-sensitive devices can result from mis handling and inappropriate methods of storage; the practical issues for handling ESSD are addressed in Section 19. Many processes are required throughout the air craft's operating life to ensure that it complies with the applicable airworthiness requirements and can be safely operated. The generic term for this range of processes is continuing airworthiness. Section 20 reviews some practical installation requirements, documentation and test equipment required by the avionics engineer to ensure the continued airworthiness of aircraft electrical and electronic systems. The term ' maintenance ' is used for any combination of overhaul, repair, inspection, replacement, modification or defect rectification of an aircraft or component, with the exception of the pre-flight inspection. Particular emphasis is given to wire and cable installations since these cannot be considered (or treated) as ' fit and forget '. System reliability will be seriously affected by wiring that has not been correctly installed or maintained. Persons responsible for the release of an aircraft or a component after maintenance are the certifying staff. Maintenance of an aircraft and its associated systems requires a variety of test equipment and documentation; these are required by certifying staff to fulfill their obligations in ensuring continued airworthiness.